Our staff team of professionals specializing in authentic Land Transport Law and the Law on Traffic, Traffic and Road Safety; are dynamic people with extensive experience and endowed with a specific and continuing education in the legal field we try.. In addition, our computer equipment is one of the most advanced on the management of administrative sanction proceedings, allowing us to offer a fast and efficient service to our customers. GESTRANS® provides a permanent legal advice service to all our customers to resolve any questions or concerns regarding the regulations governing road transport and traffic regulations, traffic and road safety.. This service covers both national and international, with offices partners in Portugal, France, Britain and Italy. Also we offer an extensive team of lawyers collaborators to meet any legal requirement that may arise outside the scope of traffic and transport. We offer legal reassurance to all our customers. GESTRANS® will immediately initiate administrative and/or judicial claim of penalties applied. GESTRANS®, founded in 1993, is the leading provider of legal services and technical management for road transport companies, offering its clients a range of services difficult to match in quality and professionalism. Our headquarters are located in ZAISA Transport Centre in Irun (Guipúzcoa) where are settled many of the most important companies engaged in road transport throughout the country. It is a privileged site for the circulation and transit of increasingly intense international transport vehicles performed. A transport sanction, a demobilization or repair, have solution in GESTRANS®. Likewise, our activity beyond the borders of our country providing direct services in countries like Portugal, France and Italy, always 24 hours, 365 days a year. Our customers come from all autonomous regions and from most of countries of the European Union, expanding coverage of our services not only national but also international. GESTRANS®, apart from its headquarters in Irun, has offices in Madrid and Lisbon as well as staff seconded to the major cities of Europe. 1990 – Gestrans starts moving his first steps as personal enterprise, in order to defend legally transport companies on penalties in the terrestrial domain (LOTT). It will be the first company in the country in change management and payment formula in Management and Advocacy. 1993 – Birth of GESTRANS® brand reference in the world of legal services to transport. 1996 – Born GESMULTA a powerful control and online support – the first in Europe – where customers can see the monitoring and defense of all transport sanctions. In the same year Gestrans is one of the first companies to obtain authorization from the Ministry of Transportation to release international transport sanctions imposed on non-residents in our country. 1998 – We open the delegation in Lisbon. 2000 – We add to our portfolio services like tele tolls and ferries. 2001 – The trade name INTEGRALIA GESTIÓN TRANS SL is registered. 2004 – We open the delegation in Madrid. 2005 – We launched the VAT recovery service throughout Europe. 2007 – From Gestrans experience in the world of transport born Gestracking, a powerful geo-location and FM System. Gestracking is the first company licensed directly from Google and afterwords studied by the company (Case Study). 2008 – Born the flagship product, the Bidean Card, that minimize the waiting times for money disposal and for payment of penalties through Europe. 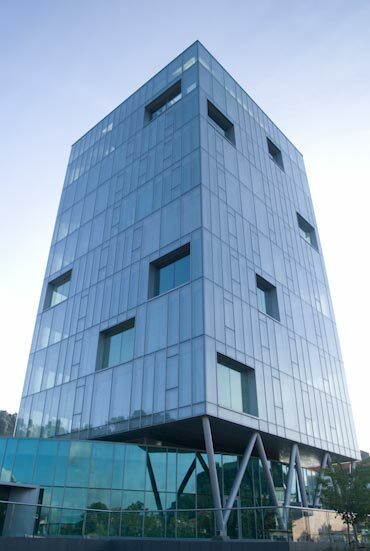 2009 – We moved our headquarters to the Tower of Zaisa offices, one of the most modern buildings and pointers not only in the Basque country but in Europe. 2011 – We introduce the so-called recovery service health cent. 2013 – Born, together with our external partners, Legal 24 Europe, to meet our customers on defense throughout the Union. 2014 – We expanded our offer to Customers with Gestrans Digital, one of the digital tachograph data reader more efficient in the market. Resolutely we follow a path that has no turning back and where our solutions are the goal for all professional carriers that strongly trust us, “Gestrans”.